A key pillar of this ‘implementation agenda’ is the establishment and/or the strengthening of dedicated national mechanisms responsible for implementation coordination, reporting and follow-up (NMIRFs). An increasingly large number of States, including Georgia, are today putting in place different and increasingly sophisticated national mechanisms, and are also working together to share experiences and cooperate. Last year, OHCHR compiled a global study and guide on NMIRFs, which was also instrumental in drawing international attention to this important area of UN work. The guide helps identify emerging good practice at national level and demonstrates the added-value of such structures in coordinating and tracking national follow-up and implementation, while reducing the ‘reporting burden’ on States, and boosting the mainstreaming of human rights across national policies. A ´no one size fits all’ approach, the exchange of good practise, at bilateral and regional levels, as well as technical and capacity-support are emerging as important ‘trends’ in this dialogue. Motivated by the promising work done so far, and a desire to willing to bring all these efforts together, in early 2017 a new Group of Friends was established. As key aspect of the implementation agenda, and the development of inclusive, transparent and effective NMIRFs, is to understand and strengthen the contribution of parliaments, both in their own regard, and as a platform for exchange and dialogue between governments, NHRIs and civil society. The legislative branch of government must necessarily play an important role in implementing UN human rights recommendations. Many recommendations require new or amended legislation. Indeed, by some estimates, as many as 50-70% of accepted UPR recommendations require legislative action in order to be realised. Parliaments can also play an important role in overseeing government implementation and compliance. It is also important to note that the implementation of international human rights recommendations often requires national budget appropriations – again requiring parliamentary engagement. Recognising this importance, the Council has adopted a number of resolutions, the latest being resolution 30/14, inviting States ‘to promote the involvement of parliaments in all stages’ of the work of UN human rights mechanisms, including the UPR. This includes involving parliaments in the preparation of national reports (e.g. 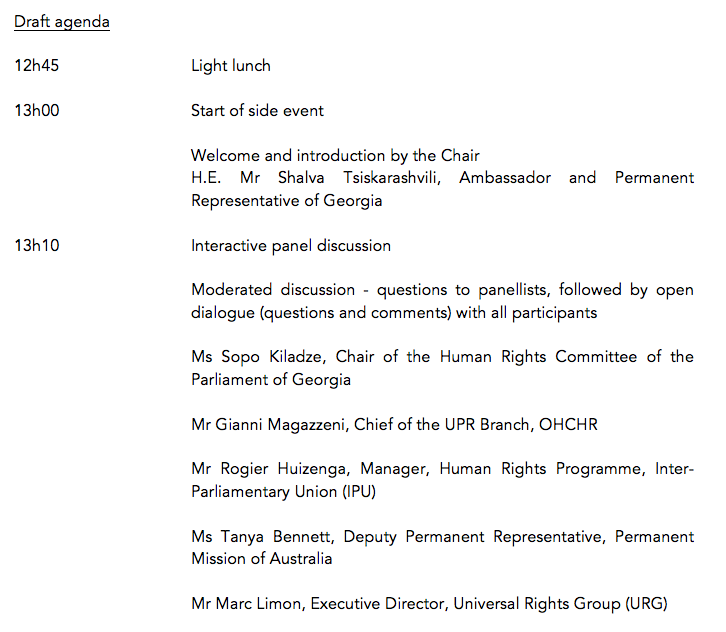 in the context of Treaty Bodies reviews and the UPR), involving parliamentarians in the implementation of UN recommendations, involving parliaments in domestic oversight of progress, and even including parliamentarians in national delegations to the UPR Working Group. Parliaments can and should also take steps themselves, without being invited to do so by the Executive branch of government. This is especially true in the context of leveraging the oversight role of national legislatures. For example, there are examples from around the world of parliaments requesting information from governments on progress with the implementation of UPR recommendations, of parliaments summoning government ministers to discuss implementation, and of parliaments holding hearings with NHRIs and civil society to discuss the fulfilment, by governments, of their international human rights obligations.